IGC, usually known as Inverse Gas Chromatography but which I prefer to call Interfacial Gas Chromatography is a powerful technique for exploring the interfacial behaviour of (especially) particle surfaces. This booklet has two purposes. The first is to provide a guide to what IGC can currently do for you. The second is to point out the fundamental flaws in how IGC has been used in the past, and how it can be developed into something far more insightful for those wishing to better understand what is going on at the surface of their (complicated) particles. Beyond "more of the same"
You just click to download it and start reading in the format of your choice. 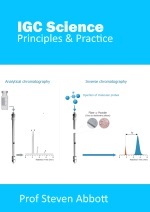 By linking to the apps in Practical Chromatography you get all the benefits of the live apps. On an iPad, for example, a click on a link takes you to see it in Safari and a 4-finger swipe allows you to go back and forth between book and app. On a laptop it's even easier to swap between the two views. PDF. IGC Science Principles and Practice.pdf. [If you want to download it, use right click.] On a high-res tablet or laptop, PDFs offer a good reading experience and it is the simplest to get going; on a smartphone it may be less pleasant to read. ePub3. IGC Science Principles and Practice.epub. This works on phones, tablets, PCs, Macs with modern ePub3 readers such as iBooks, Calibre, Azardi, IceCream etc. How do you get it into, say, iBooks? I use Dropbox on my iPad and choose iBooks to run it. You may find other ways via, say, email. Kindle mobi. IGC Science Principles and Practice.mobi. Mobi is generally agreed to be a deeply unsatisfactory format and it is frustratingly hard to get the format right, but Amazon continues to use it so we all have to produce it as best we can. This version seems to work OK but don't blame me if there are glitches. How do you get it into your Kindle reader? On my PC I simply put the file into the My Kindle Content folder and run Kindle for PC (it won't work on the Windows App version) where it automatically appears in my available books. I don't have a stand-alone Kindle reader so I don't know how to get it on to one of those, but I believe it is not too hard. For simplicity/reliability, footnotes are at the end of the relevant paragraph. My task has been to find the good, useful scientific principles and distill them into words and apps that allow people like me to use the principles in practice. In addition to reading books and many academic and conference papers, I've had the chance to interact personally or via email with some of the world's IGC science experts. All through the book, and in any app where I needed help with the algorithm, I acknowledge their generous inputs. All the credit for the science goes to them. All the blame for errors in describing and implementing their science goes to me.